Your front doors look great. Did you buy the pumpkins white..or paint them? Loved the front door arrangements. Not bad for two wreaths. I already had the feathers and I borrowed the moss from my tree. The wreaths themself are about 5 years old...they have seen some holidays! ...12.00 for both. Thats what makes my day! your wreaths are beautiful (so are the plaques and the tassles). I am not usually a Wal-mart fan but it has been a great place for fall projects this year. I purchased some fall ribbon there a few years ago that I loved and as luck would have it they had it again this year so I stocked up! Their pumpkin spice candles are also really good for the $. Your front doors are very welcoming. 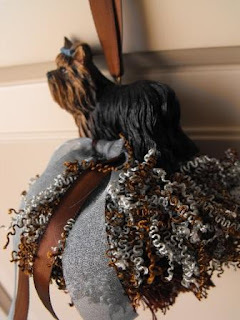 Love the tassels - if you ever make a border collie, let me know. And yes. In my opinion, those words on the wall ARE hard to apply. The hardest part was rubbing the letters off the backing to the front(ing? lol) to apply them to the wall. Does that make any sense? It took my husband over an hour just to transfer it from one sheet to another. Nevermind how long it took to actually put it on the wall! Love the wreaths! Love it all!! I'll have check out the local WalMart. I never think to go there as it is a bit out of the way. Looks like it could be worth the trip. 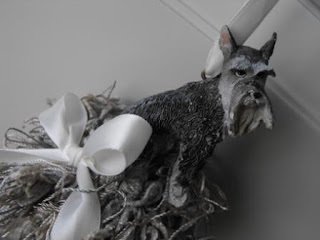 Oh, Susie, you need to make a pug tassel! I'm owned by a pug that I'm crazy about! I love your front door wreaths! I love using feathers too!! I've made one for my sister in the spring. Love your double doors and the wreaths are beautiful. Why are you tempting me with that rooster? Susie, I love your front door arrangements. Those are gorgeous...and how beautiful your doors are. I have always loved double frontdoors. Your wreaths are lovely. 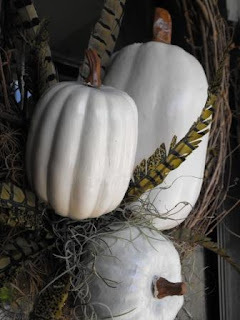 I like the white pumpkins. My Mom is coming to visit me next week and we are going to cook up a wreath for my door. Thanks for the great ideas as always! p.s. I have a yorkie too! I love that tassel! But mine is a boy, Harley. This is the first year I have seen everyone do white pumpkins...such fun! Your tassels are the BEST. PLEASE tell me you have a Welsh Corgi and a black lab. I need them - they would have a very happy and loving home in SC. Please leave me a note on my blog or a comment on yours. You and Lemon Annie are making my mornings happy! I LOVE your front door wreaths!!!! OMG....I am eyeing two things in your ETSY store!!!!! How beautiful Susie - everything! I love the plaques, too. Do you still have the mixer tassel available? great job with your front door! 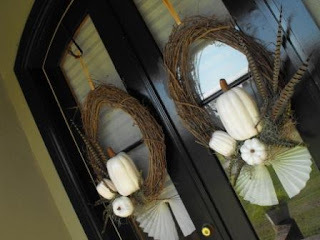 ok-maybe I am a little slow-but I am wondering how you got those pumpkins to stay in the wreath with florist picks. Aren't they too top heavy? Please-could you tell me-I am a little confused. if I can avoid this feeling-I like too, cause I am like this alot! I love the new tassels! I love the wreaths! Very pretty. The double doors are beautiful but, yeah, they can get expensive to decorate. Great job making something beautiful on a budget! Your doors look fantastic - I love the white pumpkins! 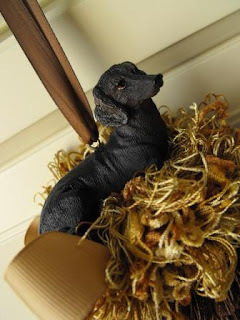 LoVe the doggie tassels, but where's the best dog of all - Golden Retriever? 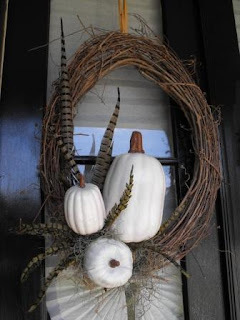 LOVE the pumpkins on the wreath. They are perfect. Hi Susie! The wreaths look great! I've got to find some of those feathers! They're so perfect for fall. Love your plaques too. 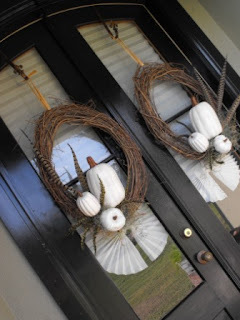 Love your black front doors...and the fall wreaths you made to hang on them are perfect! Oh! I feel so welcome! Just lovely Susie, the feathers add just the right touch. I won't wait next time! Your door looks great! And I love your plaques as much as I love your tassels. I hope your world has settled back down from the storms. I am just glad you and your family are safe. 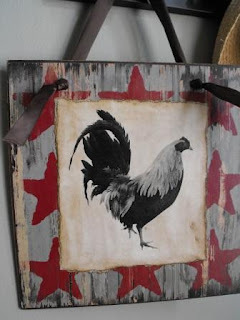 The white on the black doors is beautiful and I'm counting the days until my rooster plaque gets to me from your Etsy shop. I think I swiped it from there before anybody else could even see it. I am so behind on all my fall decorating!!! But thankfully I get to see your beautiful works of art! Looks great! Where did you get those white pumpkins? I can't find white pumpkins anywhere! Very pretty wreaths. I love the plaques and the tassels! SOOOOO pretty! What a gift from God you've been given. HI Susie! Thanks for visiting! I love the wreath and the pumpkins! You have me soo inspired!! August ~ so it would be a perfect item in my house. Hmmm.... Those plaques are wonderful too. You are quite talented Miss Susie. It's so fun mixing up new textures and colors from the traditional. Feathers and white pumpkins a very creative design with such beautiful results! Get your circus peanuts ready for a fun project!! Oct 1st will also be the $200 giveaway announcement!!! Hi Susie, I love love your door. I've been looking for white pumpkins but haven't seen any yet. Of course mine will never look as good as yours. If I find some would you come over and do my centerpiece? Hi Susie, how are you? Your wreaths look so cute! Gosh, you are so talented. You made such elegant wreaths. Very smart to not use glue. I am off to look at your shop. I am catching up this early Sunday morning. 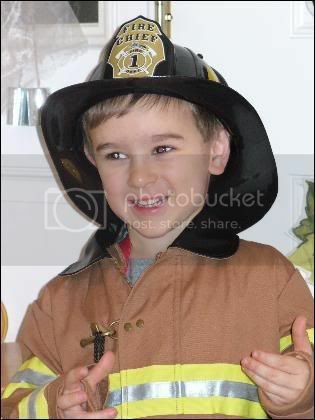 I've been looking at the photo of this post on my sidebar a couple days and just now getting here to see the story! WOW!! Fabulous, Creative, Clever!!! I mean, it's really too bad that you aren't talented and creative - sheesh!! Susie, you are making us all look bad. Or amazing if we just copy your ideas! Those wreaths are great! 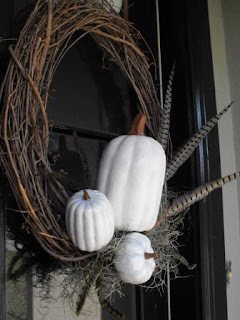 in love love love with the feathers and the white pumpkins! so fantastic! Wow, You sure are amazing with all that you create. I know you can't keep up with everyone who leaves a comment. Next year I've decided that our church needs a craft fair, so since I spoke up I'm sure I'll be planning it. This will give me enough time to make things for it. I'm looking forward to learning a lot from you. Beautiful work and beautiful family. Hi Susie :) Thanks for stopping by... yep, Autumn is doing wonderful... still spitting up, but she sure is enjoying her apple baby food! Love the wreaths you made! LOVE the wreaths - you are so creative!!!!! 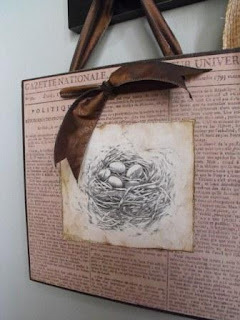 I love, love those hangings with the birds nest on them~your tassels are beautiful too! 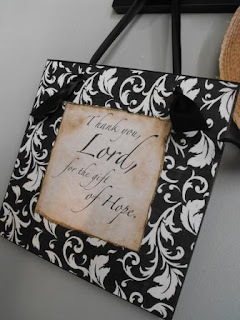 You have a beautiful blog and family~thanks for all the great ideas! I LOVE your wreaths, just beautiful! You are very inspiring.